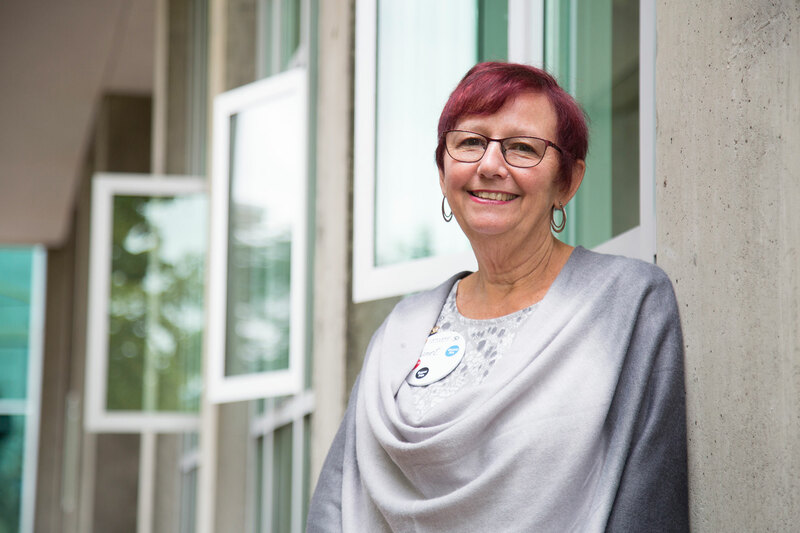 Janet MacDonald worked full-time at a five-and-dime in 1969 while she studied Early Childhood Care and Education (ECCE) at Capilano (then-College), which had just been established the year before. She kept up her studies and graduated with a diploma in ECCE in 1971. Janet MacDonald connected with other first grads and faculty members at the First Grads Reception on September 10, 2018, Capilano University’s 50th anniversary. Photo by Taehoon Kim. Upon graduating from Carson Graham secondary school in North Vancouver in 1969, MacDonald received a scholarship of $100 to study at Capilano University. “It was only $100, but $100 paid for five classes because they were $20 a class,” she says. The scholarship augmented MacDonald’s earnings from her waitress job at the coffee bar in Stedmans, which operated across from the Sweet 16 clothing store on Lonsdale Avenue. After work, she attended her college classes at West Vancouver secondary school, where CapU operated until 1973, from 4 p.m. until 10 p.m. In 1975, MacDonald returned to Cap as a substitute in the childcare centre. She ended up working at the University for 35 years. She remembers a sense of camaraderie from those early years of working at the fledgling college and is pleased she was involved with the development of the new, and current, childcare centre, which opened in 1996. “I was so fortunate to have such a great opportunity to work there from the drawings up,” she says. MacDonald retired from CapU in 2011 and now works four hours a day at the StrongStart Centre at Boundary elementary in North Vancouver.